Port Elizabeth: Space just for the birds, not the Wallabies? 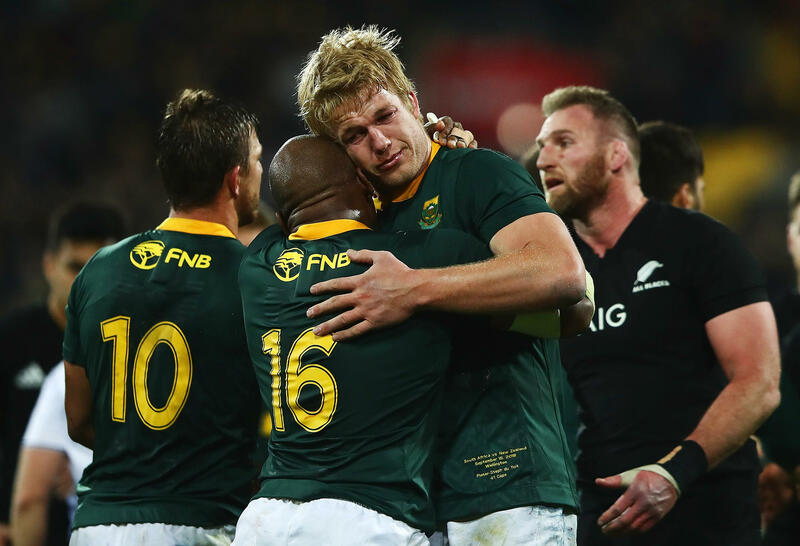 The Springboks’ historic win over the All Blacks in Wellington a couple of weeks ago threw down the gauntlet to Australia. It gave notice of South Africa’s potential to develop as a global force under Rassie Erasmus, but it also laid out a roadmap for opponents wanting to beat the Bokke just as well. New Zealand scored six tries in a losing cause, and they made breaks and metres down the edges all day long, as I illustrated in my article at the time. Playing away in the Republic is a unique experience. The grounds tend to be harder and the ball is much livelier on the deck. It travels further and moves differently in the air, especially at altitude. In the tackle, defenders are able to dig in their studs and collisions occur with greater force. Kiwi have used the environment to their advantage of late, employing variations on a movement-based theme, keeping the ball in play at every opportunity, with infield kicks and long periods of phase play. They have steered clear of set-pieces and natural pauses and, above all, have waited for the right moment to outflank an opponent who thrives on the ability to make dominant frontal tackles and win heavy contact. Their avoidance of every ‘Ooh!’ and ‘Aah!’ in the crowd as the next defensive crunch goes in has been monastical. New Zealand goes into contact with South Africa on their own terms, or not at all. There has been a rugby epiphany for the All Blacks in the devout adherence to that policy. They have beaten South African by finding ways to go around them, rather than through them, and it will be no different at Loftus Versfeld next weekend, as the Rugby Championship drama plays out its final act. With Michael Hooper and Ned Hanigan in the back-row, the Wallabies looked as if they were primed to use a similar plan to wear down their bigger, African opponents. They put up the right kind of numbers on offence, kicking six fewer times than the Springboks, forcing South Africa to make twice as many tackles, and controlling the lion’s share of territory and possession. In the end, it all came to nought, because of a lack of tactical appreciation when play shifted towards the touchline. At the core of that is a simplistic idea of how space in the wide channels can be exploited. The Wallabies knew the space would be there, make no mistake about it. All of South Africa’s matches since Erasmus took over have featured erratic defensive behaviour on the flanks, particularly by the two wings. But the game itself proved to be a lesson in the value, or otherwise, of the floating pass designed to get them into the wide spaces directly – and that lesson, at times, applied to both sides. The education began on the first serious play of the game, an exit by Australia (at 0:40 on the reel). Kurtley Beale looked as if he was ‘playing to orders’ when he threw that long pass off his left hand, but the seven points could so easily have been avoided. On the replay from behind the posts, the South Africans could see the exit coming. Malcolm Marx was pointing frantically at Beale, both of Will Genia’s feet were directed towards his outside-half, and Faf de Klerk was preparing to fly out of the line and hit him as soon as he received the ball. 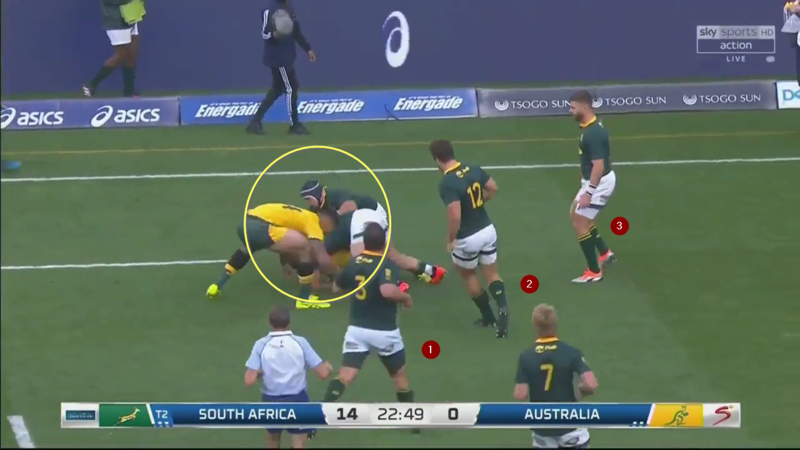 And, as we know and the Wallabies knew, Aphiwe Dyantyi’s first move is always to jam in sharply between the passer and his intended target, looking for the interception. But, despite all the alarm bells ringing, Genia passed to Beale and Beale threw the wide ‘floater’ automatically anyway. There could be only one result – but another, much safer option was available. Matt Toomua was standing directly behind the ruck, well away from the pressure a crouching De Klerk was about to deliver like the hammer-blow of Thor – or maybe Thor’s mini-me! The Springboks nearly repaid the compliment only a few short minutes later, with Jesse Kriel floating a pass out towards Cheslin Kolbe and Israel Folau a fingertip away from making the interception and cantering away for an easy score. The cumulative lesson from the two examples is quite clear: don’t throw a long floater when the defender can still make a break on the ball. If he hasn’t made his intentions known, don’t make that pass! There were two examples of both sides doing it right, waiting for the outside defender to plant or turn before making the delivery. One resulted in a try for Australia, the other in a long break for South Africa that really should have been converted into seven points. 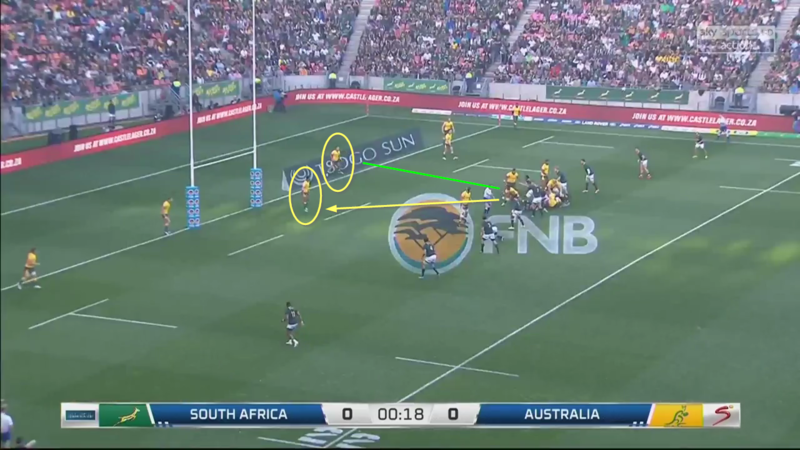 First, here is the long Springbok breakout – from the more revealing angle from behind the posts. Le Roux waited until he knew the last Australian defender (Genia) was fixed before he delivered the long ball over the top, that is his ‘cue’. Genia got his own back in the 26th minute, on an attack close to the South African goal-line. Genia took a few steps across the field to pull in the defence and force them to take root. By the time the floater reached Reece Hodge on the right wing, Aphiwe Dyantyi had been turned around completely, to the point where he was facing his own goal-line! It is, without doubt, a stupendous delivery by Genia, travelling more than 25 metres in the air off his left hand while still in motion towards the defence. But the halfback’s long pass was an oasis of success in a desert mirage of ‘wins’ that were only apparent in nature, and this where the Wallabies’ attacking naivete played its part. In this instance, Beale waited for Cheslin Kolbe to stop and turn before launching the long, floating pass to Hodge. At first glance, the situation looked promising, with Hodge in about 15 metres of space down the left. Then reality hit. Hodge’s progress was arrested after only ten metres, there were two Springboks versus one Wallaby over the tackle, and they had the three defenders closest to the action. In fact, Folau did well to clean out against the numbers and preserve possession. This ‘bait and switch’ was performed on at least half a dozen occasions by the South African defence – here are another couple of examples. 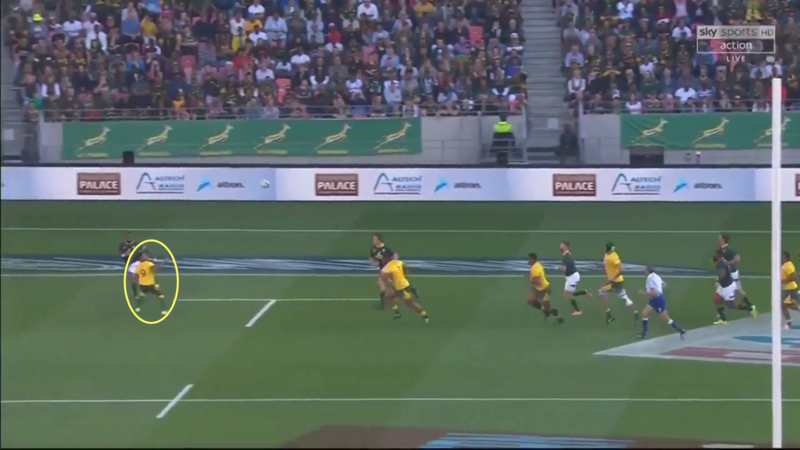 In the first case, the long ball from Matt Toomua to Hodge reached its target but Folau once again found himself outnumbered at the breakdown, which meant the best outcome for Australia was slow ball from the ruck. At the worst, it would be a turnover. In the second example, the ball went forward straight from the hand, although there is nothing on the outside in any case. The Wallabies played rather better against South Africa in Port Elizabeth than they had done versus the Pumas on the Gold Coast. However, the tactical naivete of their attempts to exploit the space out wide cost them dear. The interception of Kurtley Beale’s floated pass on his own goal-line was seven points right off the bat, and that left away side firmly behind the eight-ball in a hostile environment. The insistence on using the long, floated pass into space only paid out a dividend on one occasion, three metres from the goal line. 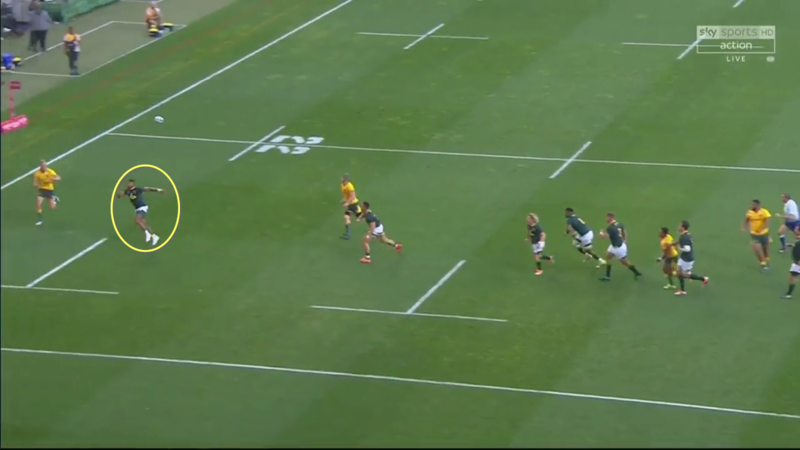 For the rest of the time, the Springbok defence recovered to make tackles and disrupt the ensuing breakdown, or benefited from a mistake by the passer. The recipient of the majority of the passes was Reece Hodge rather than Israel Folau or Marika Koroibete, and that only increased the size of the tactical question mark. The use of Koroibete as a dedicated open-side defender and chaser of kicks often means he cannot get into the game on his natural wing – so Hodge has to push out and replace him. It is an awkward solution, if indeed it is a solution at all. As the end of the Rugby Championship approaches, there is only one opportunity remaining for Michael Cheika and his coaches to prove that they can not only get the answers to individual questions right, but also get all of the answers to all of the questions right in one single match. The environment at the Estadio Padre Ernesto Martearena in Salta is unlikely to be any more hospitable than the Nelson Mandela stadium, so he cannot expect any help from that quarter.